Ships today if you order in the next 11 hours 42 minutes. Does your skin need some calming? Tell it to tone things down a notch with the Calming Skin Therapy Toner from Aubrey Organics. 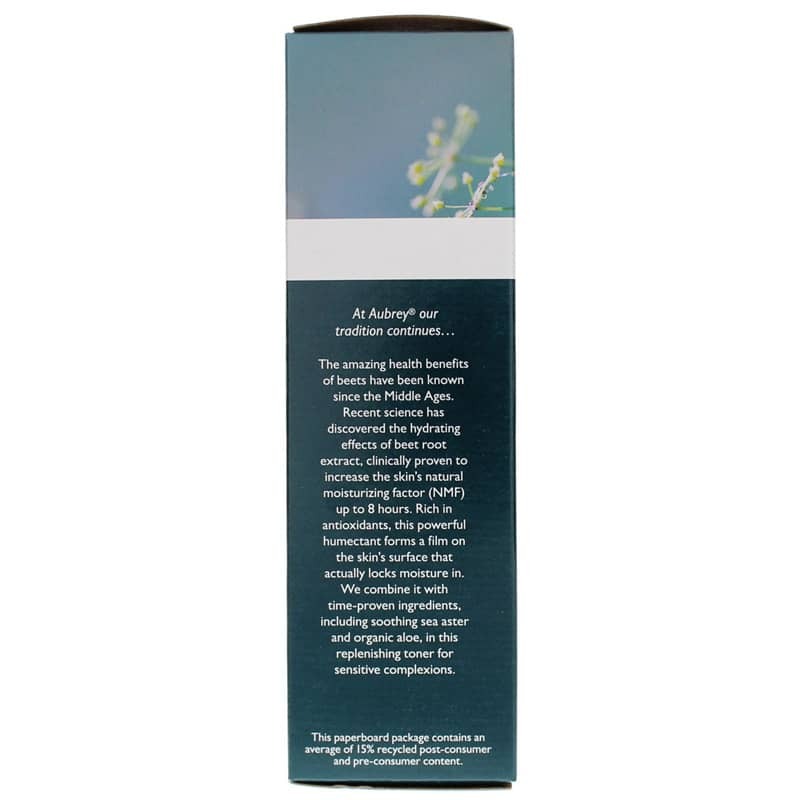 For Aubrey's line of Calming Skin Therapy products, this gentle, alcohol-free toner is perfect for sensitive skin. With organic aloe vera and sea aster extract, it helps calm and refresh sensitive skin while prickly pear helps firm and protect. This powerful and therapeutic humectant is rich in antioxidants and forms a protective film on the skin's surface to help lock in moisture for up to eight hours, keeping your facing looking and feeling calm and nourished. Taking great pride in quality, Aubrey Organics products are certified to contain organic ingredients that meet NSF/ANSI organic standards. In addition, they're certified cruelty free by the Leaping Bunny program, and they're completely vegan and even gluten free! Calm things down with some all-natural, skin-soothing therapy. Order the Calming Skin Therapy Toner today! Contains NO: gluten. Vegan. Cruelty-free. Shake well before using. 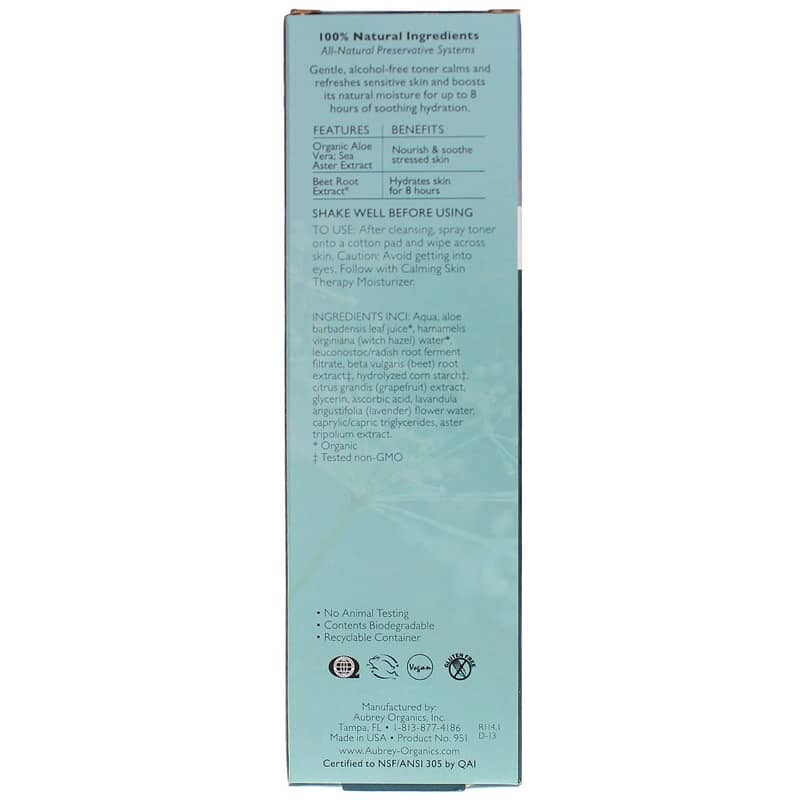 After cleansing, spray toner onto a cotton pad and wipe across skin. Avoid getting into eyes. Follow with Calming Skin Therapy Moisturizer. I wanted to love this product, along with the cleanser and moisturizer which I also purchased, but I found that it gave me a burning sensation on my face. Surprising for a product that is for sensitive skin. I discontinued the toner and tried the other products without it. Same result.